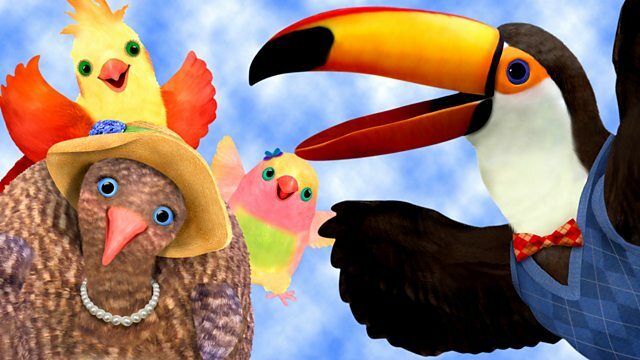 Adventures of a group of birds who teach children about social responsibility. Muffin wants to see a dinosaur and is disappointed at finding out they are no longer around. Browse content similar to Dinosaur. Check below for episodes and series from the same categories and more! Make way! Samuelsaurus rex is here! You make way for ME - Rudy Ceratops! # You better hide when you see me open wi-ide! # I'm fierce and large so watch out when I cha-arge! Sam'l, Muffin wants to meet dinosaur. You want to meet a real dinosaur, Muffin?! Muffin, I don't think you can meet a REAL dinosaur. -Sam'l, Muffin meet dinosaur NOW. Why don't we ask Mr Beakman? What can I do for you birds? Muffin wants to meet a real dinosaur! Oh, I'm very sorry, Muffin! TICKING About 65 million years. Thanks for clearing that up, Mr Beakman. -What's the matter with Muffin? She just found out there aren't any real dinosaurs. And now she'll never meet one! No need to worry! There's always a way! We'll build a dino with papier-mache! We'll make it out of papier-mache. -Oh, think nothing of it! Muffin, don't be scared. It's your dinosaur! But it's only a toy. but she's too scared to play with it. Hmm. Well, I think it's a lovely dinosaur. Muffin, are you quite certain you don't want to play? Muffin no play. Muffin scared. Come now, Muffin, don't be afraid. Mr Beakman is right, Muffin. -# Now look at these wheels! Sam'l, 'Udy, Muffin love dinosaur! No, you have to do the roaring yourself. -# Hold on tight so your bottom doesn't end up sore. # Muffin, how's the view from way up there? -# A girl who loves a dino. Muffin really wants to see a dinosaur and is heartbroken when Mr Beakman tells her they are no longer around. Samuel and Rudy build Muffin a giant papier-mache dinosaur, but it scares her. Mr Beakman helps Muffin to overcome her fear and she rides the dinosaur around the tree!